Wishing You a Very Happy New Year 2016! Over the last few months the Garbage Crisis has worsened in the city of Bengaluru, the streets have piled up with mountains of Garbage and is raising stink, may even lead to an epidemic. We do understand that the dumping yards around Bengaluru have been shut down, and rightfully so the residents in the nearby villages have refused dumping of Garbage from Bengaluru that has polluted their Air, Water, Soil and created severe Health problems. Bengaluru has to own up its Garbage, city should take full responsibility for its Garbage and manage it within the BBMP limits. City Garbage cannot become a problem for the neighbouring Villages or Towns. Having said that, BBMP is not adequately equipped to address the crisis either, Garbage Mafia has systematically entrenched and weakened the Administration over years. Setting up multiple Composting units and Dry Waste processing centres do take time and cannot be hurried, but the Garbage Crisis cannot wait for the units to become fully operational either. 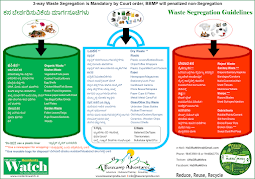 Separate Vendors for Wet Waste & Dry Waste Collection: This will forcefully implement Segregation at Source, improve Collection method and foster Timely Collection. Ban all quality of Plastics Bags: Plastic Bags are the key ingredient to the current Garbage Crisis. Govt has already initiated promotion of subsidies cloth bags via Karnataka Handloom Development Corporation sold through Priyadarshni Handloom stores across the city. These cloth bags if well promoted can become an excellent alternative and can provide livelihood for underprivileged via various Govt schemes. Create Ward wise SWM Committees: In addition to Ward Committees a focused SWM Committee that includes Citizens, Activist & BBMP will increase monitoring and co-ordination, and will increase Citizen participation. Invest in Awareness, Manpower & Training: BBMP Awareness programs are not reaching out and are not effective too. Use of Social Media, SMS and Workshops are the need of the hour. NGOs, SWM Experts and Activist have to be engaged more effectively to take the message to the citizens. Pourakarmikas are indeed the least trained/equiped and a lot more is left to be done in this space. Penalize non-Segregators: This is indeed a much needed strategy, Garbage Collectors or Pourakarmikas can give a regular update on households or entities that are not Segregating as source, a heavy Penalty can indeed ensure they fall in line. Government has already initiated Waste-to-Energy plant, but Bengaluru has to plan for managing Waste of over 9000 tons per day. Even though the Wet/Compostable Waste makes up to 60% of Bengaluru Waste, what is not been estimated is the quantity of Construction Debris. The SWM Policy should include a clear plan for managing Construction Debris, today Construction Debris are getting dumped at Lake beds or on Roads as there is absolutely no estimate of quantity or a defined destination for Debris. BBMP has to re-estimate the Quantity and Composition of Bengaluru’s Waste, new SWM Policy should include Source, Collection, Transport, Destination (Processing/Treatment/Disposal). We do believe that Citizens involvement is very critical to overcome the current Garbage Crisis and as a group of Active, Concerned and well informed Citizens we would like to extend our support to BBMP and to Spl Commissioner SWM to address the Garbage Crisis more effectively and quickly. Look forward to engage with the BBMP/Administration, and to work towards making Bengaluru Garbage Free.